Home » Monetisation » What is a Gacha? An example of a Gacha machine in Tokyo, Japan. 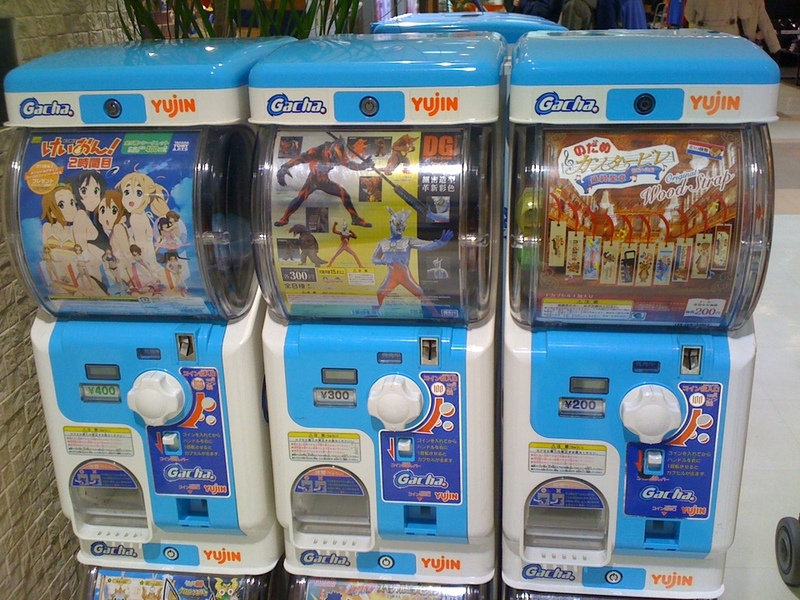 Gacha is a monetisation technique used in many successful Japanese free-to-play games. But what exactly is a Gacha? In Japan (and now in the West too) a Gacha is toy machine into which a customer puts money into. They then twist a crank and out pops a plastic egg, inside of which appears a prize, usually a collectable toy figure, which is part of a complete set. 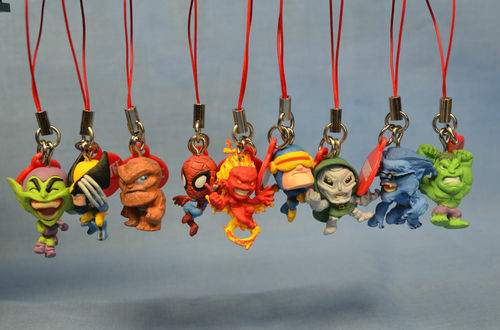 My completed set of Marvel Gacha I collected in Japan. Look at Dr. Doom! The caveat of completing the set is that some of the toys are rarer than others, meaning that usually you have to play the Gacha quite a number of times before you can complete the entire set. You also often get duplicates, which encourages you to trade them amongst friends for other figures you are missing. It’s actually very fun to participate in the process of trying to collect a Gacha set. The rare-egg Gacha machine in Puzzle and Dragons, one of the reasons why this game pulls in over $20m a month. So how does this free-to-play games then? Well in a seriously lucrative way is how! Looking at Puzzle and Dragons for example, players can play the rare-egg Gacha for 5 Magic Stones (the Hard Currency in the game) to collect a new monster. The player never knows what they will get, but they will always get something good, which is key to the popularity of the mechanic. As this video demonstrates, pulling the handle of the rare-egg machine is a lot of fun, and the surprise, mystery and intrigue is all part of the user-experience that makes it addictive and compulsive to keep playing the Gacha. Gacha is essentially a gambling mechanic and that’s the reason why it’s such a strong monetisation technique. 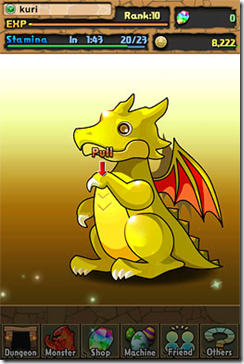 In P&D, if a player knew what monster they would get, they would not play the Gacha until one they wanted cropped up. But because there is only a chance of getting the one they want, they have to gamble to get it. Going one step beyond a regular Gacha, this technique is now outlawed in Japan due to the crazy sums of money players (especially young players) were spending on IAP in games. 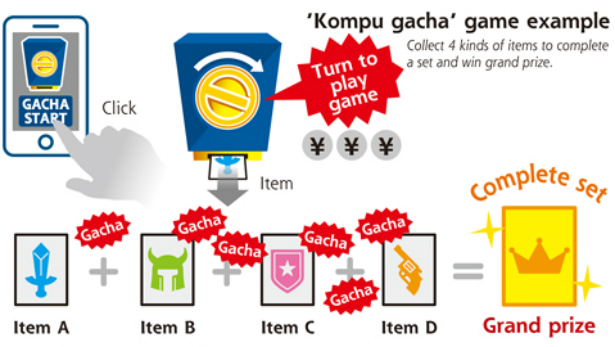 A Kompu Gacha is a series of Gacha’s that must all be completed in order to collect a “grand prize”or item, such as a epic-rare card or super powerful in-game item. Usually the Gacha starts of in a mild way, such as a 10% Gacha, but then usually gets harder and harder, going from 10->5->2->1% chances. This means that the chance of getting the grand prize is incredibly low, but this important piece of information is never telegraphed to the player. A visual example of how Kompu Gacha works. This resulted in crazy profits for Japanese companies GREE and DeNA who added this mechanic into virtually every game they had to maximise profitability and revenue. Though now outlawed in Japan, this mechanic is used by some games in the West. The game Megapolis by Social Quantum being the most obvious example I can find. An example of Kompu Gacha from Megapolis. 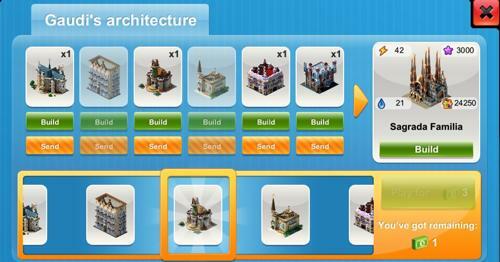 To build the Sagrada Familia, you need to acquire a series of other parts. However, those parts can only be collected via a random selector (Gacha). I’m personally not against Gacha, as I think it’s a fun mechanic and as long as the player always gets something good, it’s not a cash-grab. However, I do think Kompu-Gacha is a step too far as it is essentially a pure gambling technique that uses dishonesty to make the compulsive types spend over and over again. Of course, in the hunt for increasing revenues and profits, I can understand why this technique is still used.